This was once the community of Higgins. The East Fork crossing was in this area instead of where it is located today. Several early settlers who lived near the East Fork crossing are buried in this cemetery. The area is now just south of Lowry Crossing. This cemetery covers 1 acre. A deed for ½ acre is listed in Vol 29, p 292. Another deed for ½ acre, listed under the name of Thomas, is in Vol 29, p 294. In both deeds the cemetery is deeded to the county judge and his successors in office. There are 4 fenced family plots: Baker, Stiff, Poston, and Kindle. The unfenced Higgins plot is on the northwest front, separate from the rest of the cemetery. There is a house in front of the cemetery with a sign that says Higgins/Enloe Club. Enloes are buried at Wilson Chapel Cemetery which is about 1 mile northwest. The community of Enloe was on the west bank of the East Fork in this area. This cemetery was cleaned in late October, early November 1989 by some school children and several Collin County Genealogical Society members. The cemetery shows spotty maintenance since that time. 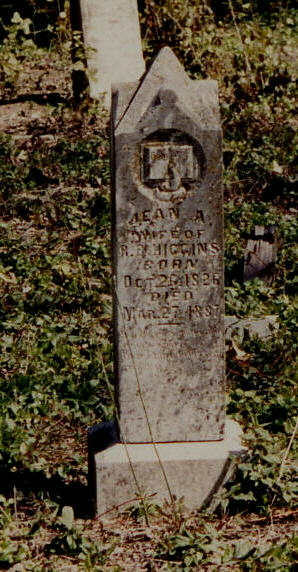 A follow-up visit on 3/8/93 shows that the cemetery is being maintained. A visit in September of 1994 shows that the cemetery is not being maintained. Portions of it are being cared for and there has been one small chain link fence installed around some of the graves. The cemetery itself is unfenced. This cemetery can also be reached by taking US 380 east from McKinney to Bridgefarmer Road. Go south on Bridgefarmer Road to FM 546. Take FM 546 east and south about 1 mile to CR 398.